Different Christian denominations similarly look to different texts as authoritative and/or understand their nature in relation to God in different ways. The Bible (from the Greek byblos or "books" in the plural) is a collection of texts, some taken from Hebrew religious writings and others from the body of Greek manuscripts that emerged from the early Christian community in the first few centuries after Jesus' ministry. The canon (meaning "accepted list", from the Greek kanon, for rule) of books in the Bible varies between traditions, but most traditions now regard their canons as "closed", that is not open for negotiation or able to be added to. In addition to the Old Testament (texts dated before the life of Jesus) and the New Testament (texts dated after the life of Jesus) Christian scholars also refer to texts of greater or lesser importance and/or authenticity; the Apocrypha contains texts that sometimes appear in the main canon of other traditions (they are sometimes referred to as deuterocanonical, literally "of the second canon"). Click here for a good summary of how the canon developed and how it differs between Christian traditions. Texts in the Bible represent a number of different genres, from law to history, from poetry and wisdom literature to letters, but denominations disagree on the amount of what could be understood to be a direct divine revelation found in Scripture. 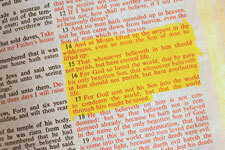 Catholics would argue that there is very little, particularly in the New Testament. Even the Old Testament books of prophecy are viewed as the prophets' reports of what they heard or saw. Given this, it has been difficult for them to see the Bible or any part of it as the literal words of God. On the other hand, Protestants cite 2 Timothy 3:16 ("All Scripture is inspired by God"), which refers to the Old Testament, and 1 Corinthians 11:23, where Paul claims - as elsewhere - the Lord as his direct source. Similarly, Old Testament prophets such as Jeremiah (1:7-9) and in the New Testament, John, say they have been given the very words of God (Revelation 1:2). There is a whole range of interpretation between literalism and myth, which is most clearly seen regarding the biblical account of creation in Genesis 1:1-2:3. A small number of Protestants (six-day creationists) still accept it as historical, whereas far more Christians accept it spiritually or poetically while still seeing it as inspired, and still others understand it in terms of a myth, a story designed to convey a truth while not being literally true in itself. Most Christians believe that the Bible must be interpreted, that texts must be subject to exegesis (from the Greek exegesis "to lead out") if their wisdom is to be understood. Biblical criticism – subjecting biblical texts to minute literary analysis – has dominated university theology departments in Western Europe and the US since the nineteenth century. Of course there are have been numerous disagreements about how the texts should be analysed, but the net result of biblical criticism has been that Christians tend not to accept the authority of the Bible without corroboration. For example, the Bible suggests that most of the Psalms were written by King David and that each of the Old Testament prophets was responsible for the book that bears his name. Today most Christians understand that the formation of the Bible was a long and complicated process and the texts we have today have been through many stages of "redaction" (editing). For another example, Christian ethics has long since moved on from being lists of laws extracted from the Bible which are applied absolutely. In the thirteenth century Aquinas noted the problems inherent in taking phrases and passages of scripture literally. His Doctrine of Analogy explained that any description of God's actions should be understood analogically, sharing only part of the meaning of the same term applied in a temporal sense, and that the Bible should be "read through the lens of doctrine" and kept in Latin so that only those trained by the Church should have access to its uninterpreted words. It was this approach that led in part to the Protestant Reformation. Martin Luther (pictured) and his ideological descendants made much of the Roman Catholic Church's refusal to allow ordinary people to read or hear the holy texts in their own language and the fact that services were conducted in Latin, often beyond a solid screen and without any participation from the congregation. Protestants translated the Bible into many tongues and took full advantage of the printing press, when invented, to produce many editions which became affordable to all. Today it is often said that the Bible has been translated into more languages and that more copies have been printed than any other book. Christians do not usually see their treatment of the physical book as related to their respect for its contents (though there are some exceptions). This is certainly a change since the Reformation, the Enlightenment and even the twentieth century; before this, copies of the Bible were made by hand, often illuminated and turned into works of art, and given a position of honour in wealthy homes. Even in the nineteenth century it was usual to have a "family Bible" which was used to record all significant events – the dates of births, marriages and deaths in particular – and often it was kept in a special "Bible box" or on a high shelf by itself. Today it is not usual to have much ceremony about how the Bible is kept in the home or even in a church. Perhaps this is a product of biblical criticism (which was enabled and encouraged by the Reformation and the subsequent Enlightenment thirst for understanding) and the widespread acceptance that the Bible is a product of human history as much as it is a mysterious record of God's wisdom.